I am, admittedly, a brand loyal and lover of Diet Coke. We have a relationship going back to TAB, the sugar free alternative to Coca-Cola and the competitor to Diet Pepsi. In the 1980’s, Diet Coke replaced TAB and quickly became the diet cola beverage of choice – or at least my choice. During that time span, the structural container or package remained generally the same. Glass bottles gave way to plastics, and the aluminum got thinner but 30 years later we still reach for a bottle or can of soda. The challenge today is how do you maximize relevance and creativity within significantly limited space, with limited printing capabilities and on a mass distribution basis? Of course advertising and marketing play a large role in communicating the brand message but there is still the challenge of the container itself. All brands invest significant effort in creating and reinforcing the brand image of their products. The addition of flavor cues and beverage styles vary within brand color palettes, serving to quickly and simply communicate the differences in product flavor and content. Looking at a retail shelf, we quickly see how brands distinguish themselves from each other with their “owned” colors, and it is surprising to realize how imprinted each of us have come to instinctively reach for the blue or red product simply because we have learned where that product is or it is our preferred flavor. And really, what is there to know? We are buying carbonated flavored water to quench our thirst. It is a question of personal taste. But that is the challenge – how can you create a product that has both individual and group appeal? That is where Diet Coke has had a creative breakthrough. 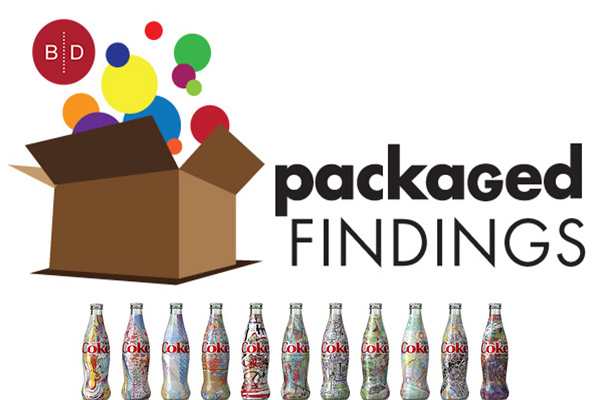 They have embraced the trend to connect the product relationship with the consumer and used its most powerful and omnipresent tool to make that connection – packaging. They have created a design program to appeal to the tastes of their fans, elevating the ubiquitous soda can to the level of accouterment. Their advertising slogan says it best – “IT’S MINE”. Partnering design, technology and production they now have packaging that stands up and steps out and off of the wall of “brands”, and immediately brightens the lives of their customers. There is a wide and varied collection of designs that are joyful, fun, active, and vivid – and dare I say effervescent? They raise the bar of expectation. Diet Coke is no longer just a can of soda – it is MY can of soda, MY brand. Coca-Cola does all of this while staying true to their established brand hierarchy. 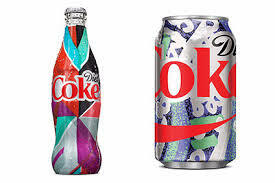 Over it’s history, Diet Coke has used a variety of thematic or seasonal packaging graphics to appeal to the broad consuming public. In my opinion, Diet Coke has attempted to individualize packaging on a large-scale basis and “personalize” a highly depersonalized product – to deliver an expression of individuality along with a beverage. They have applied design coordination to graphics standards across a broad range of containers, sizes and formats, and coupled it with a marketing campaign that includes the ability to submit your own unique bottle design in a contest. Unfortunately the campaign will run for a limited time but I hope that Coca-Cola will find that customer engagement with the program is worth expanding upon it. When Diet Coke becomes a fashion accessory at Fashion Week, it has achieved style status. I am just happy to have the designs I selected stocked in the fridge where they stand out as brilliantly as they did on the store shelf.